At Balanced Health Medical, conveniently located near Rockefeller Center, is your Midtown chiropractor and rehabilitation center that offers a whole lot more than spinal care. Our NYC chiropractors provide comprehensive and individualized treatment for common sports injuries like tennis elbow. Tennis elbow is caused by strain and inflammation in the muscles which extend your wrist. These muscles (specifically, the extensor carpi radialis brevis) attach at the outside of your elbow and run down the top of your forearm into your hand. If a person performs many repetitions of wrist extension movement (often paired with elbow bending) then these tissues may rub against bone or experience gradual tears in the fibers. This repetitive movement is usually the underlying cause. In addition to tennis and racquetball players, other people at risk for tennis elbow include painters, plumbers, carpenters, butchers, chefs, weightlifters, mechanics, and people who work on an assembly line. It can also affect people of all ages but tends to occur between age 30 and 50. These symptoms generally worsen with activities requiring you to grasp or turn something. They tend to start gradually and worsen over time and are typically due to cumulative and repetitive stress. We invite you to stop by our clinic to discover the type of high quality care our Midtown chiropractors offer. 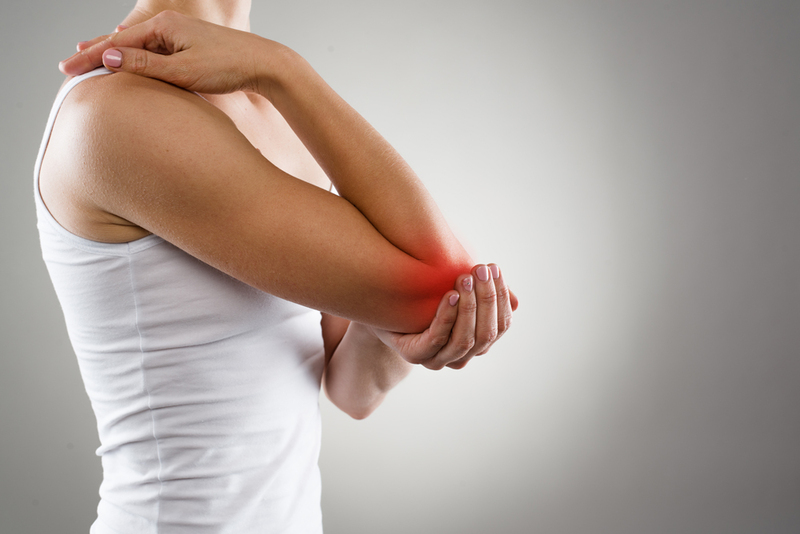 If you're experiencing tennis elbow, our drug-free services can reduce symptoms and minimize recurring damage. We provide these services following a thorough examination, where we rule out other causes of elbow pain (including referred pain from the cervical spine) and identify your unique risk factors. Our ultimate goal is to reduce inflammation and pain, promote cellular and tissue healing, and eventually restore grip strength. This is possible through techniques like acupuncture, corrective exercises, soft tissue massage, and body mechanics/ergonomics training. If you’re looking for a chiropractor in the 10022 zip code, including Midtown East and Midtown West, contact Balanced Health Medical. For drug-free relief from lateral elbow pain, we encourage you to contact our Manhattan chiropractors. Contact us today by calling (212)-755-1717.